On Sunday, we went to Hyde Park for music again, but this time we sat outside the concert walls and listened to some Dave Mathews and Bruce Springsteen, who opened his set with London Calling originally by The Clash. However, Dave Mathews played All Along The Watchtower which was pretty cool too. I met Megan and Alan there (with Daisy, as you can see) and they brought some Pimm’s and fresh cookies, so the evening was perfect. Lorie is in Seattle right now, so she missed out on the relaxing Sunday in the park with live music. But about the organized crime… Before I met up with them though, I was sitting on a park bench near the entrance watching the ticket scalpers when one of them came and sat next to me. He only did that because he was frustrated that the cops were around, who were hurting his business (scalping tickets is illegal). He never did tell me where he got the tickets from, so I’m not even sure if they would get you into the concert or not. After a while though, someone sat next to him and bought some tickets, so he was able to still work even with the cops standing nearby. And the guy had a good wad of tickets. He also gave everyone his phone number (or someone’s), which was odd. There was a whole group of these guys with one “ring leader”, so it was all pretty organized. Therefore, I am considering this my brush with organized crime in London…. ticket scalpers in Hyde Park. Saturday morning started with Megan, Alan, Daisy, and me catching a train to southern England to the small town of Seaford. From there we did a 13.3 mile hike heading east on the South Downs Way public footpath, which is a popular hiking route in the area that consists of rolling hills over what is generally called the White Cliffs of Dover, even though we were a few miles southwest from Dover. This was the nicest hiking path I have ever been on, since it was short grass, which was pretty much like walking on a golf green. We also lucked out with the weather and had warm sun all day even though we could see big clouds and thunderheads to the north of us. We ended the hike in Eastbourne with a long walk along the rocky beach before catching the train back to London. If anyone wants to do a nice hike in the summer in England, this is the one I suggest. 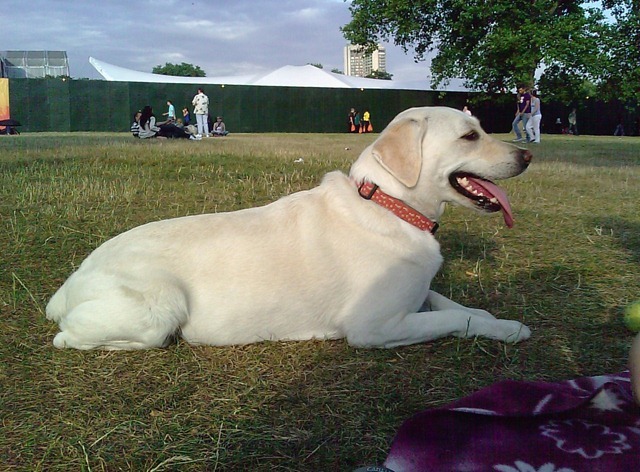 We went to the Hard Rock Calling concert at Hyde Park tonight to see The Killers and The Kooks. 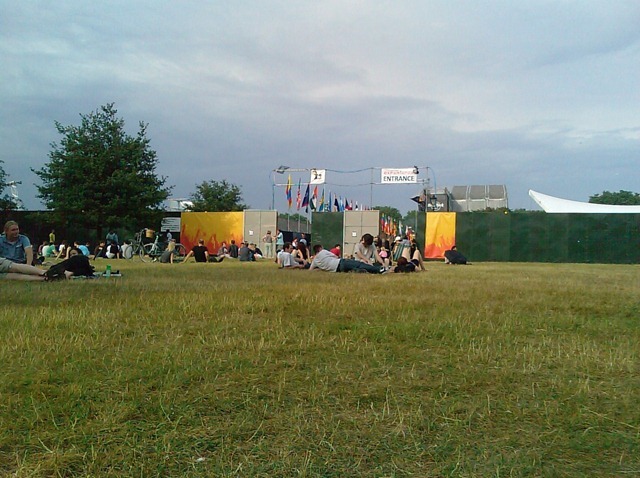 Seeing a concert in the park here is like going to a fair, complete with a variety of food stalls and drinks. The interesting thing about that is that you can walk around, grazing on different foods (meat pie, hot dog, ice cream, etc) while listening to the music. We of course made our way deep into the crowd during the Killers show, which was fun and very warm. Since all of the beer bottles are plastic, many of them get thrown from one area of the crowd to another. They don’t seem to hurt when you get hit by one, but thankfully I never found out. You just have to watch out for ones that still have beer in them, since a spiralling beer bottle tends to shower everyone below it in beer. Welcome to the future of parking in London. I just saw this today when walking around during lunch. This is an electric charging station with an electric scooter being charged. This one is on Spencer Street near city hall, which is near my office. 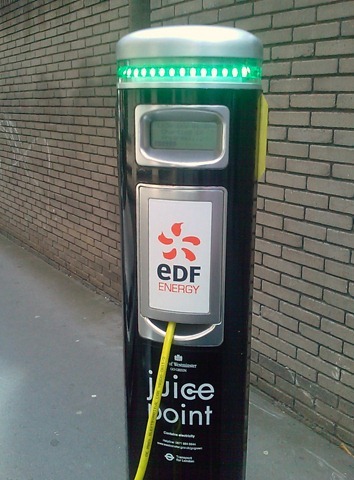 It is one of 72 charging stations (aka, “recharge points”) in London. 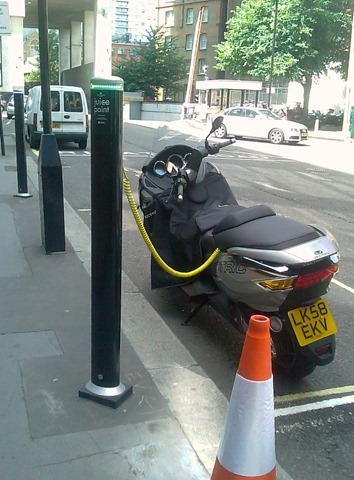 This one costs £75 per year to park there and recharge. The recharge points are from Elekromotive and are generic with the intention that any electric vehicle can recharge with them. The scooter is from Vectrix, which I’ve seen at the British Motor Show. Warning…. 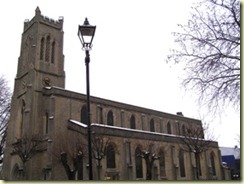 this is a slight educational blog, not an adventure: For the last 3 years, I have been wondering why the church bells in Fulham and Putney (maybe all of England, I’m not sure) ring so often. And it isn’t so much that they ring, they really just drone on with the same note over and over again, sometimes for 15 minutes at a time. Sometimes this is on the hour and they eventually change the pace (can it be called a tempo when it is only one note?) and gong x number of times depending on the hour. Since I am working from home today due to the tube strike, I finally decided to investigate it because there seems to be no reasoning as to why I hear this bell go on and on. 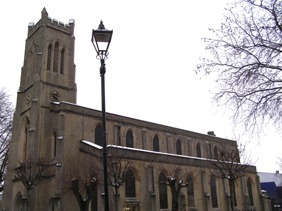 I learned that bell-ringing is quite the tradition in England and is even referred to as “the most English of sounds”. But this is more in reference to a tune played on these huge church bells. Playing a tune with these bells is referred to a peal or change-ringing, which started in England in the 1600s. There is even a weekly journal for church bell ringers. Yes, weekly! If you want to visit any of the churches that play interesting tunes with their bells, you can refer to the Dove’s Guide for Church Bell Ringers, set the locations of some churches in your TomTom, and make a road trip out of it. I even learned that us non-bell ringers refer to bell ringing as camponology, which got it’s name from Campania, which is a region around Naples in Southern Italy noted for bell making. As exciting as all this is, I still haven’t figured out why the bells in the churches I walk past only drone on with a single bell with a constant tempo. My only theory is that the churches that I hear only have one bell and the bell ringer just isn’t that creative of a musician. Or perhaps they are trying to drive everyone around them crazy. In truth, it probably has to do with some old English tradition that I haven’t figured out yet. We saw “Waiting for Godot” last night at the Haymarket theatre, which is located in the West End and has been around since 1720. The play has been around since 1953 and is about two bums who simply try to pass the time while waiting for some guy named Godot. Or maybe it is much more philosophical than that, which is what makes it interesting. Nothing really happens in the play, so it’s a good thing the two main actors (Ian McKellen and Patrick Stewart) were very good. We went to a “cooking with cheese” event at La Cave à Fromage last night and had a great time, but didn’t learn anything about cooking. We were basically test subjects for the store manager who wanted to try out different cheese+food combinations. We had 6 different tasters, plus a salad of sorts (chorizo & pomegranates) and some breads and pastries. Wine too of course! The store is across the street from the Institut français du Royaume-Uni (French Cultural Institute), so we figured it was a safe bet that we would get good cheese there. And we did – it was all very tasty.